Cocktail Hour: The Mint Julep — Irresistible! A julep fit for an emperor! It is the KENTUCKY DERBY today, and you know what that means!! Mint Julep season is kicking off, and in my mind, that means summer has arrived! Oh, how I love a mint julep!! 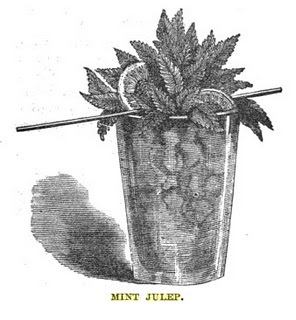 Place mint, sugar and water in the bottom of a julep cup or rocks glass. Muddle until the flavor of the mint has been released. Fill up glass with crushed or shaved ice, then add alcohol. Stir vigorously until the outside of the glass is foggy with condensation and cold to the touch. Enjoy. This julep is my Derby standby. Allow yourself the pleasure of the addition of Peach Brandy (or a teaspoon of peach bitters) to your everyday Julep routine. You won’t regret it. This is Thomas’s rather decadent first entry in the “Julep” chapter of his book. Place half the mint mint, sugar and water in the bottom of a julep cup or rocks glass. Muddle until the flavor of the mint has been released. Fill up glass with crushed or shaved ice, then add Cognac. Stir vigorously until the outside of the glass is foggy with condensation and cold to the touch. Use you stir or spoon to pull out the mint springs; insert fresh sprigs into the ice with their stems downward. 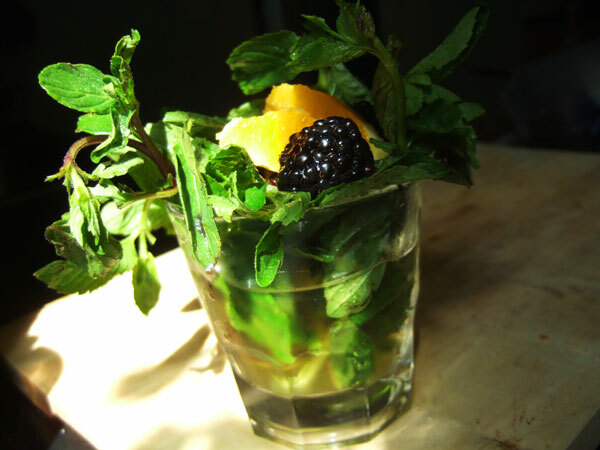 Arrange berries and orange slices within this mint bouquet, pour the rum over top, and sprinkle with sugar. This was the first time I’ve tried Thomas’s julep recipe: Drunk through a straw, the cocktail is actually pretty amazing, albeit a little over the top. The straw is necessary, so you don’t whack yourself in the face with mint every time you take a sip. The liquor is sweet and very, very minty. I think I’ve been skimping on the mint in my juleps: one should pack that glass full for the best flavor. The fruit on top, drizzled in rum and sprinkled with sugar, is also special treat. But one needn’t be so extravagant in their julep enjoyment. Don’t just savor a Julep this Saturday, but sip them all season long. Remember: the Mint Julep is the drink of the summer! It does look like a boozy flower arrangement!!! It really is fit for an emperor. I am loving the peach brandy addition since I just got some great peach liqueur and am dying to try this! I have a feeling it will knock me on my backside but… what the heck. Wonderful photo, Sarah! Oh, you will love it with peach liquor! I’ve used that to substitute the brandy as well. It’s incredibly delicious–the only problem is it goes down a little too easy! Thanks, deana! Not quite sure about this one Lohman, this guy might have his salad and his liquor bars mixed up.